A Spotlight breakdown for all available roles has gone out to agents. If you have an agent and feel you are suitable for a particular role, please ask them to contact us. Anyone without an agent who feels they are suited for the show and a particular role, please read the details below carefully. Below are available roles. Please note-all other roles have been cast. 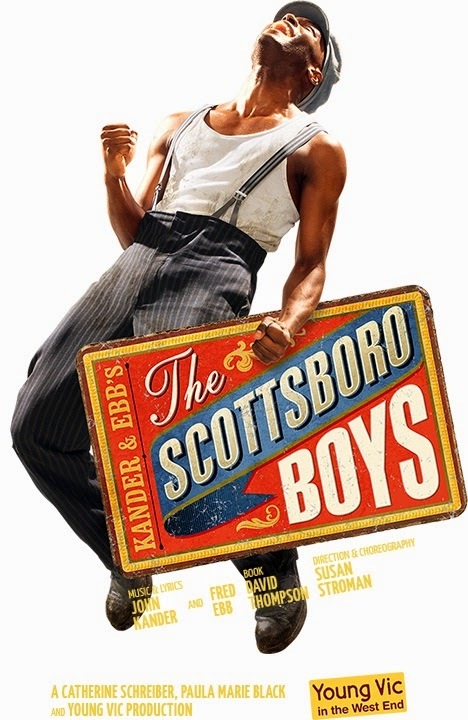 If you do not have an agent and would like to be considered for one of the roles below, please send a CV, photo and links to any dance and/or vocal clips to office@jillgreencasting.org with "THE SCOTTSBORO BOYS-Role Name" in the subject bar. Reads as early 20s. Likes to exaggerate. The liar. Always acting bigger than he really is. He also plays Victoria Price, the white girl who sticks to her story. Mean, tough, tries to play the Southern flower but can't. Funny. (sings comedy duet with Ruby Bates). High tenor, bottom C to high C. Dances well. Reads as early 20s. Likeable. Curious. Always going a little further than he should. Likes to show off. He knows how to read. He also plays Cousin Billy. High tenor, bottom C to top Ab. Excellent tap required. Reads as early 20s. The bully. Ornery. Starts fights. Belligerent. Determined to stand up for himself. Ultimately, when he gets the chance, he doesn't. Also plays the Preacher, the fire and brimstone prison minister who is just a little too anxious to please the white jailers. Funny. Bass/baritone, bottom Db to top G. Must dance well. High tenor. Excellent tap required. The youngest of them all. Na•ve. The baby. Constantly has bad dreams. Tries to act tough, but is still a kid. Doesn't understand what is happening. He also plays Young George. To cover several roles, playing age late teens to early 20s. Strong actor. High tenor to top C. Must dance well with excellent tap. To cover the Interlocutor, being played by original UK cast member Julian Glover. A tall gentleman from the American South, kindly, who oversees the Minstrel Show. Loves to recall the good old days that never really were. Baritone, bottom C to top C.
Playing age: Late 30s / 40s. To cover 'The Lady', being played by original UK cast member Dawn Hope. No singing required. Rosa Parks. Southern seamstress. Working class. She is smart, clear-headed, compassionate and brings a sense of humanity to the story. Poised and slight.